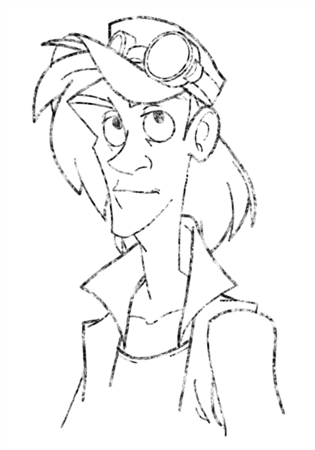 Paper textures are bitmap textures that you can apply to your brush strokes as you draw. They act as transparency filters that are tiled over your brush strokes to make them look grainy, as if you were drawing on a rough paper surface. While Storyboard Pro comes bundled with preset paper textures, it is also possible to create and use your own paper textures. 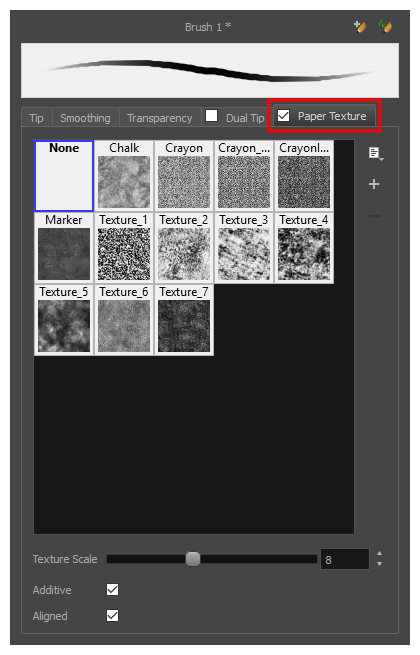 In the Brush Properties dialog, click on the Paper Texture tab. In the paper texture list, select the desired paper texture. If you wish to create your own paper texture, see Adding a Paper Texture. Using the Texture Scale slider, select the scaling factor at which to scale the paper texture when applying it to your brush strokes. If you want your brush strokes to get more opaque as you drag your brush or when you draw over them, enable the Additive option. If you want the paper texture to always be aligned to the same grid regardless of where you draw your strokes, enable the Aligned option. Otherwise, your paper textures will be positioned relative to where you start your drawing stroke, and if you draw two strokes one over the other, their paper textures will clash with each other.